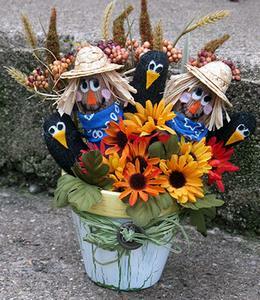 This festive patch of scarecrows and their cute little crow buddies in a clay pot are the perfect centerpiece for your fall table. Make several and give as gifts during the fall holiday season! Traditional scarecrows are made to look like a human figure, are often dressed in old clothes, and are used to scare crows and other birds away from crops? Paint the thumb, pinky and middle finger of the glove with black paint. Set aside to dry. Paint entire outside surface of the terra cotta pot with Gesso. We use Gesso because it prepares the surface for painting in one coat and dries quickly. Acrylic paint without Gesso would take several coats to cover. Once the Gesso is dry, paint the entire outside of the pot with green. Allow to dry completely. Apply crackle medium according to directions on the bottle, a medium coat works well. Allow it to dry for 15-25 minutes, until tacky but not completely dry. Next apply a medium coat of white paint over the crackle on the body of the pot and Sunflower paint on the rim. Do not excessively brush, one or two strokes is enough. Let dry, crackle will begin to work within minutes. Use the handle end of a paint brush, dip into black paint, then dot on blacks of the eyes. Set the shapes aside. Bunch together several strands of raffia to make the scarecrow’s hair. To do this, cut lengths of raffia about 4-5″ long. Bunch together about 10-12 strands and use an extra piece to tie the bunch together in the center. Use your finger to push the center of the raffia bunch into the straw hat. If it looks like enough hair, hot glue the center of the raffia bunch inside the hat. Repeat for the second hat and set aside. Your terra cotta pot should now be dry. Use green raffia to tie a bow around the pot, just under the rim. Use a spot of hot glue to tack the raffia in place at the back of the pot. This will make it easier for you to tie it around the front. Once tied, secure it in place with hot glue in several different spots around the pot. Next, take the button and thread some extra green raffia through the button holes. Tie in a knot at the front of the button and trim the ends. Hot glue the button to the front of the raffia bow on the pot. Spray the pot with acrylic sealer and set aside to dry. Check the black sections of the glove to see if they are dry. If not, you can leave the project longer, or for speedier results, use a blow dryer to help the process along. If you still aren’t sure, or if the drying process is close but not quite complete, take a tissue or paper towel and wrap it around the black painted finger and squeeze gently. This will put any excess wet paint onto the tissue. Repeat for all three black fingers. Glue the straw hats onto the tan fingers. Glue on scarecrow eyes, nose and cheeks. Use black marker to draw on scarecrow smiles and eyelids. Make mini bandanas from fabric scraps and tie around scarecrow necks, secure in back with hot glue. Trim hair with scissors. Glue on crow eyes and beaks. Place a handful of cotton batting into the terra cotta pot. Place the glove inside the pot. If the height looks good, glue it all in. If not, remove or add batting below the glove to adjust. Insert and glue in silk flowers and foliage being careful not to cover up any of the faces. Snip ends of flowers off and glue directly to the glove if needed.